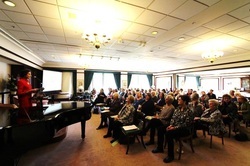 The annual Rose Scott Women Writers’ Festival 2015 was held on Friday 18 & Saturday 19 September 2015. The Festival of, about and for Women Who Make a Difference featured a wonderful range of women writers – poets, playwrights, memoirists, non-fiction writers, broadcasters and storytellers. 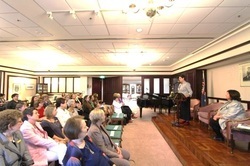 The Festival began on Friday with the Luncheon. Our chef, Peter Keenan, served a delicious repast that was complemented by the inspiring presentation by Leah Purcell, Putting My Voice Out There. The luncheon ended with the drawing of three lucky door prizes, won by two guests, Gil Appleton and Kreenah Yelds, and member, Margaret Miller. By 4.00pm The Women’s Club was transformed into an auditorium for the Soirée and Symposium thanks to the superb efforts of our Events and Operations Co-ordinator, Tim Browning. As guests arrived, they were greeted with wine and canapés and soft salon music played by Susan Deas on the Club’s Yamaha piano. 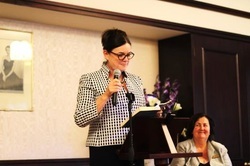 In her presentation, Hello Beautiful: Putting Words in People’s Mouths, Hannie Rayson spoke of her career as a playwright, read from her memoir and answered questions from the audience. 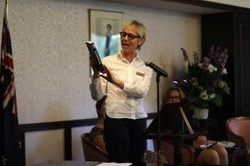 Anna Kerdijk-Nicholson’s new poetry collection, Everyday Epic, was launched by Judith Beveridge, who read selections from the work. 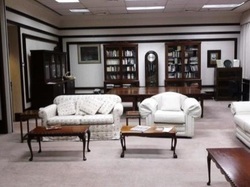 Some members took advantage of the opportunity to purchase books from the Berkelouw book shop in the Foyer. Wine, canapés and music continued until the close of the evening. Members and guests arriving for the Festival Symposium on Saturday were met in the building lobby and greeted with tea/coffee in the Club. 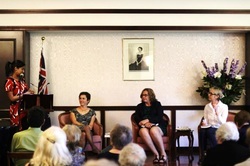 Festival Patron, Professor The Hon Dame Marie Bashir AD CVO welcomed guests with a speech that highlighted Rose Scott’s contribution to Australian society in the late nineteenth and early twentieth centuries. 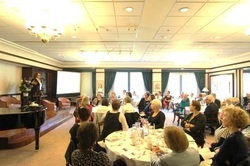 In her keynote, The Climb: Conversations with Women Who Make a Difference, Geraldine Doogue pointed to the difference between power and influence. After a delicious morning tea, Libby Gleeson, Lisa Murray and Augusta Supple explored similarities and differences in Writing Fiction – Writing History. Foreign correspondent, Ginny Stein then launched Jeannine Baker’s book, Australian Women War Reporters: Boer War to Vietnam. During lunch, members and guests availed themselves of the opportunity to have newly purchased books signed by the authors. 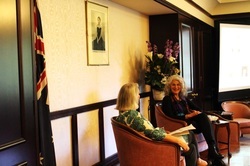 The afternoon sessions commenced with a conversation between Debra Adelaide and Susan Wyndham on the topic, Women Writers – Women Readers. This was followed by a lively talk from Lee Lewis, Artistic Director Griffin Theatre, entitled Building a Storehouse of Australian Stories for the Stage. The final session included a talk, Is that a real poem or did you just make it up yourself?, by Judith Beveridge that included the reading of her own poems. Julie Mundy-Taylor provided the final offering, the story of Scheherazade, in her aptly titled presentation, ‘Tell on,’ quoth the King: The Enduring Legend of Scheherazade. 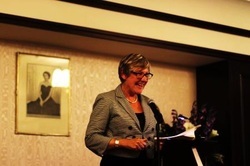 The Women’s Club President, Dr Christine Jennett offered the vote of thanks and invited everyone to partake of further refreshments before departing. Friday evenings are always a little special, because of the expectation of creativity and rest over the weekend and the leaving-behind of the trials of the week. 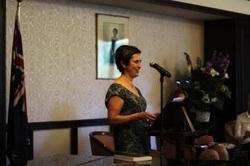 So I was particularly looking forward to having my third poetry collection, Everyday Epic, launched by the poet, Judith Beveridge in the beautiful, exclusive and elegant surroundings of The Women’s Club. It seemed an apt way to mark all those years of work, now complete, and the anticipation of creativity to come. There were pleasures in attending the Soirée that I hadn’t anticipated. I met my co-launchee, Hannie Rayson, who is an extraordinarily talented woman with a wild and self-deprecating sense of humour. Hannie read from her marvelously funny memoir, Hello Beautiful! : Scenes from a Life. I found being surrounded by an audience made up almost entirely of women — particularly as it was the ‘birthing’ of a book —supportive, encouraging and warm. The elegant surroundings lent gravitas to the event, and the intimate atmosphere was conducive to intensive listening to literature … and to gales of laughter as Hannie gave us nuggety vignettes of her childhood. There was also an element of serendipity to the programming for the Festival: Judith Beveridge was to feature on Saturday as a main speaker. I hadn’t known what the Festival program would be. 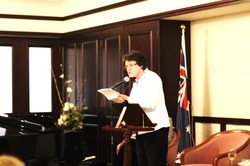 It had taken me some time to ask Judith Beveridge, the poet, to launch a book of mine. As I explained to the audience on the night, I needed to demonstrate that I had longevity as a poet and that my poems would continue to have something to say—and only then would I feel ready to ask Judy to be the launcher. In the end it had taken me 22 years to ask her! The Rose Scott Women Writers’ Festival 2015 delivered what it promised: Women who make a difference. It was a top line-up of speakers. I always enjoy playwright Hannie Rayson’s keen observations of Australian contemporary life – she is a warm and generous storyteller. Australian culture was centre stage, especially in presentations by Lee Lewis, Debra Adelaide, Lisa Murray and Libby Gleeson. Anything recommended by the poet Judith Beveridge I take note of. At the festival, she introduced me to the work of Anna Kerdijk-Nicholson (whose poem on Burke and Wills is powerful) and I loved Judith’s readings of her own illuminating poems on nature. Professor Marie Bashir provided further insight into the character of Rose Scott, a fitting way to open the sessions on Saturday. Geraldine Doogue’s discussion of leadership was fascinating. She made a distinction between those with influence and those who have power and governance of others, and examined how only a select few have the stamina and determination to attain power. I was honoured that one of the books in our NewSouth imprint at UNSW Press was launched at the festival: Australian Women War Reporters: Boer War to Vietnam by Jeannine Baker. The gutsy foreign correspondent, Ginny Stein, did the honours and her enthusiasm for the work of fellow reporters from previous eras encouraged many women at the Club to purchase the book – always satisfying for a publisher to witness. I arrived at the Rose Scott Women Writers Festival Symposium expecting to be entertained and edified by the richly varied program of presenters. With a day that began with the thoughtful and eloquent words of the always elegant Professor Marie Bashir, followed by the thought-provoking keynote by Geraldine Doogue, things were looking very good indeed. I was particularly keen to hear Libby Gleeson’s presentation as I first met her many years ago when I was a fledgling Librarian and Libby was promoting her first book. I was truly captivated to hear about her new work and the directions her writings have taken. I admired the research that Jeannine Baker undertook in order to bring the forgotten stories of women war reporters to the fore and was ready to rest my brain cells over lunch and replenish my energy for the afternoon. The warm and engaging conversation between two long-term friends Debra Adelaide and Susan Wyndham was a refreshing way to begin the afternoon’s sessions and the lighter tone was continued by the self-deprecating but obviously talented and dedicated Lee Lewis. I have to confess that with my own presentation looming, I didn’t expect to take in much of poet Judith Beveridge’s presentation. 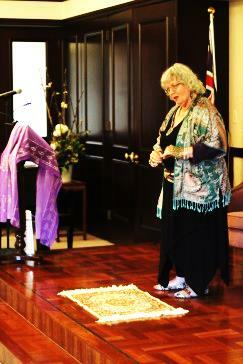 Surprisingly, I found myself entranced by her evocative words and lyrical renditions of her poems. As a storyteller who is invited to share tales in many different venues and to different types of audiences, I can never really be sure how my stories will be received. The calibre of the wonderful presenters who had preceded me in the Symposium had set the bar extremely high, so I took the stage with butterflies fluttering fit to burst. I was grateful to see the story of Scheherazade, that I love so dearly, had found a generous and receptive audience whose body language and facial expressions told me they, too, were swept up in the magic of the Arabian nights. There is no more satisfying reward for a storyteller. So my expectations of the Symposium were exceeded, but what I didn’t expect was the feast for all the senses the day would provide. The venue of The Women’s Club is visually stunning, with rich fabrics, colours and artworks to delight the eye. The food provided in abundance throughout the day was thoughtfully prepared, beautifully presented and delicious. My ears delighted in not only the wise and entertaining words of the various presenters but also the rich conversations that I was part of during the day. 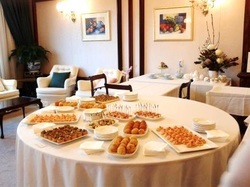 Even the sense of touch was catered for with lovely facilities and beautiful china and furnishings. My sense of smell was not only tickled by the food but also the feast of scents of the lovely women in the room.